Vida Network provides VidaTeam Service and DID numbers in over 60 countries around the world. Please contact us for pricing. Vida Network offers premium quality A-Z routes for termination of your international telecommunication minutes at lowest rates. We provide small and medium-sized enterprises such as carriers, ISP's and telecommunication service providers with extremely low rates for international calls to ANY destination worldwide. 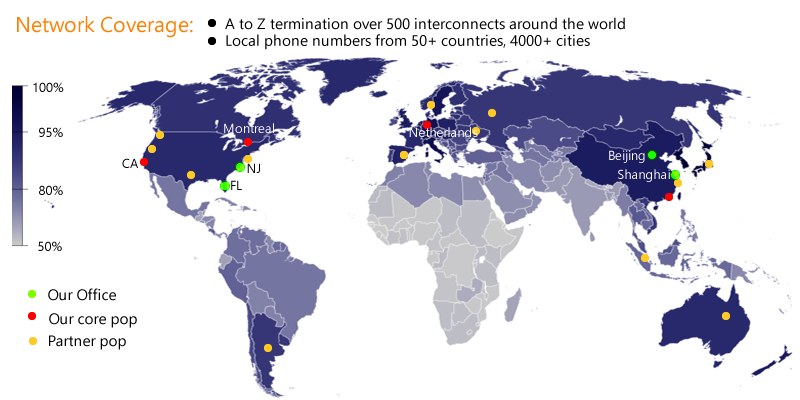 Calls are sent out via more than 150 local operators and backed up by Verizon, China Telecom and UK Datacomm, reaching each and every country on the globe. Vida Network terminates large quantities of telecom traffic worldwide. Due to our sizeable traffic in wholesale minutes, we have some of the best international rates in the industry, and therefore are able to pass these savings to our clients. Vida Network provides A-Z voice termination through interconnections with Tier 1 local providers. The quality of our connections is simply best possible. High ASR & short PDD witness the high standard of our system. Our network is supported by a 24/7 network-operation-center, ensuring the constant quality of our service. No monthly topup or volume commitment required!